166 BCE. The Greeks have conquered Judea, sacked the temple and set up a range of high-quality saunas in Jerusalem. But young Judeans refused to take this defeat – or the communal baths – lying down. They launched an uprising against the oppressors, led by Mattathias and his sons, Judea’s greatest dynasty – the Maccabees. But an equally eminent dynasty was also involved in this epic conflict. At first Geoffrey Cohen and her disciples had chosen to remain in Babylon – where there were better cafes, no animal sacrifices and if you shluffed in on shabbes morning, no one came round and dragged you to the temple. But when the Maccabees issued their call to arms, Geoffrey instructed her followers to answer it, adding that it ‘sounded like a bit of a jolly’ and ‘it might make them famous’. So the Beigel Brigade returned to the diaspora, and received a hero’s welcome from the people of Pumbedita. A large meal was immediately organised for their return, in which Babylonian dishes such as hummus and pita sat next to Biblical delicacies such as pickles and almond kugel. At the centre of this great feast was an exact replica of the temple, made entirely out of fishballs. It is of this meal that the Book of Jewdas records “On that day swords were turned into breadsticks and cannonballs into gefilte fish”. A great miracle took place that night, as an apparently small pile of beigels turned out to be enough for everyone to have six each. And, most famously, eight candles were lit, one for every gin and tonic that Geoffrey Cohen consumed. Ever since that day (apart from a few years when everyone forgot), the people of Babylonia marked the festival !الحفلة كبيرة (al-hefle kbeereh) or ‘night of large party’ on the 23rd of Kislev. Or, as Rav Geoffrey taught, ‘on a Saturday night conveniently close to Christmas’. While some reportedly celebrate another, more militaristic Jewish festival a few short days later, we only have vague descriptions of this custom and it cannot be verified whether or not these people are actually Jews at all. 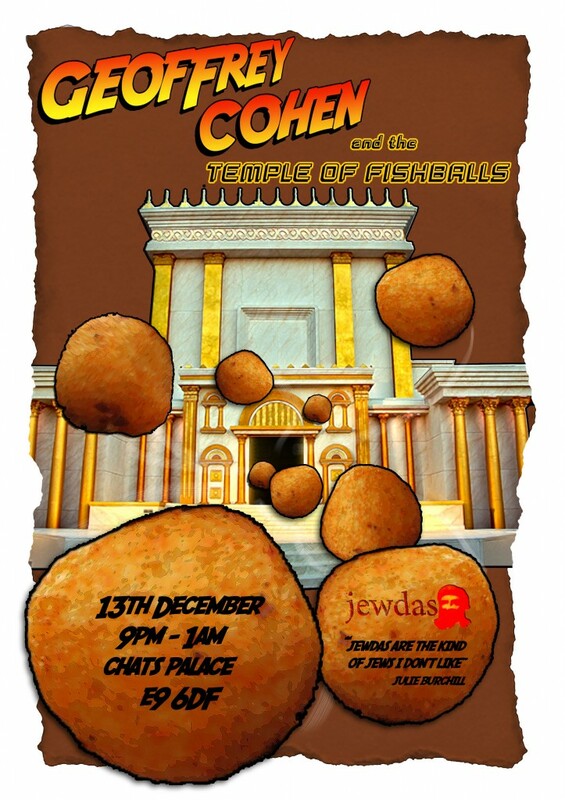 I’m not coming because the beigel whilst ideal as a form of ammunition bungs up the digestive system, as indeed does matzah. But have a jolly good time and thanks for the invitation.